At National Cycle, we won't sell, trade, or share your personal information with anybody; it's as simple as that. If you are interested in reading about the specifics of our policy, they are explained below. At National Cycle, we pride ourselves on satisfying you in every way we can. That is why close attention is paid to the way we handle your personal information. When you provide us your name, e-mail, phone number, address, credit card number, or bank account number, you can be assured it will not be shared with anyone that doesn't need it to process your order. We do reserve the right to permit official use of your information in the result of a subpoena or a legitimate legal issue. Some visitors enjoy helping us improve our website by participating in activities that include, but are not limited to, surveys and online focus groups. These activities may require additional forms of tracking so we can adequately manage and collect the information that is generated. In certain circumstances, we reserve the right to share such information with marketing agencies, including, but not limited to, our advertising agency and our web-marketing consultants, for their expertise. To participate in these activities, visitors must meet these two qualifications: 1) They must be a registered member; and 2) Agree to the rules and qualifications set forth by each specific activity. Your e-mail address is used to correspond with you regarding the following things: 1) Answers to questions from our sales, customer, and technical support staff; 2) Promotional/marketing messages that you may have opted-in to receive when you signed up your account online. You can view or change your personal information and preferences at any time by logging into the site and accessing the My Account page. However, if you would like to remove yourself from the promotional e-mail list, you will need to unsubscribe at the bottom of the promotional e-mail or reply to the email with unsubscribe in the subject line. We do not share your information with anyone outside National Cycle unless it is a request that is in the interest of the law or certified government agencies (e.g. subpoena or legal reasons). We share your information internally at National Cycle for the sole purpose of processing your order. If you have questions, comments, or want your user account deleted, please e-mail us at support@nationalcycle.com or call 877-972-7336. National Cycle wants to assure you that your transactions are secure when you place an order through nationalcycle.com. 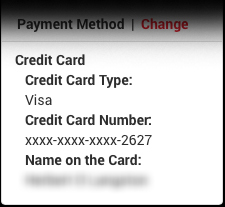 When you enter the Checkout process of NationalCycle.com you will notice the address at the top of your browser changed from http://www.nationalcycle.com to https://www.nationalcycle.com. This means you have accessed a secure SSL (Secure Socket Layer) page. The information you enter on https pages is securely passed between your computer and our web server. The Account Options page is also a secured page. Another way to tell if you are on a secure page is the padlock image at the bottom of your browser or in the address bar. An Extended Validation SSL (Secure Socket Layer) Certificate allows high-security web browsers information to visibly identify nationalcycle.com as the organizational identity of the website. The address bar will turn green (see above) and identify National Cycle Inc. as the certificate holder. National Cycle uses certification software that enables the security on nationalcycle.com. 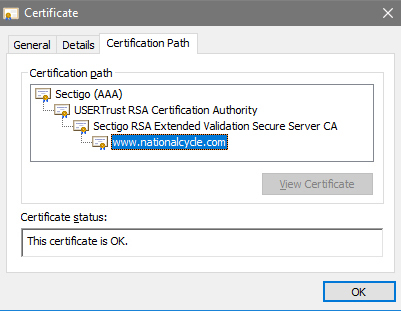 Clicking on the lock icon (above) in the address bar will show that nationalcycle.com has a current and valid Security Certificate. Every page of the Checkout process is under the secure site. Your payment and credit card information is encrypted and only used to communicate with the payment gateway to verify and approve payment for your order. Credit card information is never saved for this or future orders. Personal information, billing and shipping addresses, and order history are saved under "My Account".